Whether you’ve faced gridlock driving to your favorite museum in Washington, D.C., narrowly avoided an aggressive taxi driver while commuting to New York City, or are lucky enough to have only experienced Los Angeles’ notorious traffic jams through “La La Land’s” opening musical number, just hearing the words driving and city in the same sentence can drive you crazy. Christopher B. Leinberger, a professor at George Washington University and president of a national coalition of real estate developers and investors called LOCUS, felt the same way and co authored a report with Michael Rodriguez titled “Foot Traffic Ahead” to highlight the rise and benefits of walkable urban places (WalkUPs) in America’s largest metros. Stephen Gyor, Lead Urban Sustainability Planer at the DC Office of Planning, agreed and said land use decisions like increasing transit-oriented development to allow the greatest density along transit corridors are crucial to cutting greenhouse gas emissions. Leinberger built 15 walkable urban projects throughout the country. His projects were illegal as proposed because they were too dense, mixed use, and broke zoning requirements that called for more parking spaces than he believed was necessary. “I had to go change zoning to make it possible and it took years of time, brain damage, and millions of dollars,” Leinberger said. Zoning laws aren’t the only opposition to expanding urban sustainability. According to Leinberger, the education needs to be done at the neighborhood level. If Dupont Circle only consisted of town houses, then hotel, retail and restaurant proposals would probably face not in my backyard opposition. However, the value of residential areas within walking distance of great urbanism goes up by between 40% and 100% on the price per square foot basis. He went on to say these people have the best of both worlds because they can live in suburbia and walk to great urbanism. The DC Office of Planning took a different approach using amenities to draw people to WalkUPs. “As Mayor Bowser stated, the District’s investments in neighborhoods – from affordable housing, public infrastructure, and transportation to public schools, parks, retail, and the arts – are all making DC a highly desirable place to call home,” Gyor said. Leinberger spoke with the Washington Monthly, a left of center policy journal, and The American Conservative, a right of center magazine, to bridge the gap between politics and infrastructure. Both publications will run the same article in which he said infrastructure should be driven by whatever local governments decide they should be able to get funding for, and not by the federal government or State Departments of Transportation. 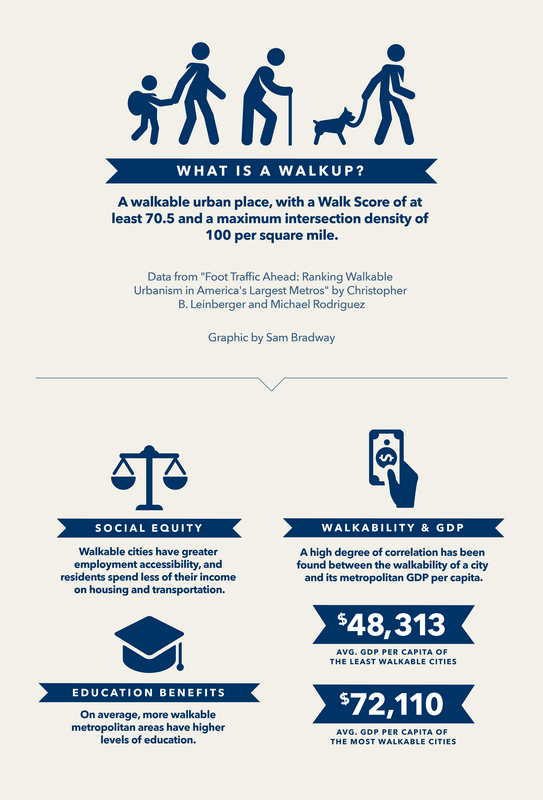 Market demand for walkable urbanism is at an all time high. Leinberger is currently working on the first ever 100% census of all real estate in New York and DC to better understand where the walkable urban places are and how well they perform economically. He is also in discussions with GW's Milken Institute School of Public Health about a place based public health metric and in discussions with US Green Building Council about a place based environmental metric.